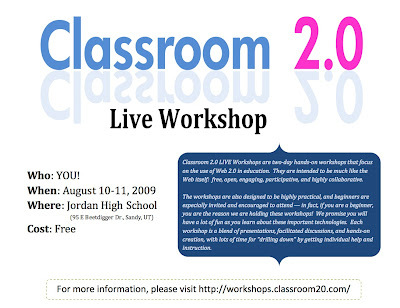 Classroom 2.0 LIVE Workshops are two-day hands-on workshops that focus on the use of Web 2.0 in education. They are intended to be much like the Web itself: free, open, engaging, participative, and highly collaborative. The workshops are also designed to be highly practical, and beginners are especially invited and encouraged to attend — in fact, if you are a beginner, you are the reason we are holding these workshops! We promise you will have a lot of fun as you learn about these important technologies. Each workshop is a blend of presentations, facilitated discussions, and hands-on creation, with lots of time for "drilling down" by getting individual help and instruction. View the agenda (and sign up to present) here. Sign up to attend here (sign up for Classroom 2.0 while you're at it). For additional information, please visit http://workshops.classroom20.com/. 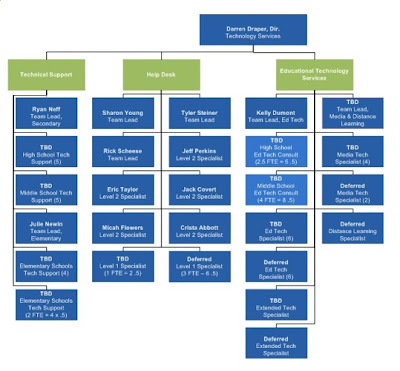 Here's a quick run-down snapshot of the team we have been developing to serve the technology needs of the Canyon School District. Serve as level 1 technical support in the schools. Will be the first point of contact for break-fix technical support issues. One Technical Support Specialist per high school, housed in the schools. One roaming Secondary Technical Support Team Lead to serve as a coach and a mentor to other support personnel, provide consistency throughout the secondary schools, and to help individual schools where necessary. One Technical Support Specialist shared among every two middle schools, housed in the schools. A team of Technical Support Specialists to service the elementary schools (geek squad approach), at a ratio of just over one Specialist to four schools (including the Elementary Technical Support Team Lead). We anticipate using smart devices to push out job requests to the Support Specialist physically closest to the issues at hand. 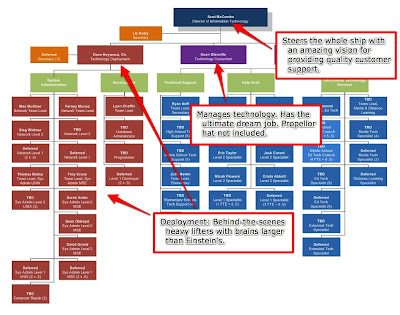 Serve in the critical bridging role between the Service and Deployment teams. Will provide some level 1 technical support to district office personnel. Will continue to support the same systems that are currently maintained by the Jordan School District Information Systems Department (and then some). At this point, the number of systems currently sits at 55, with new systems seemingly being added weekly. Will inherently provide some level 1 technical support but will focus primarily on assisting teachers and students to utilize technology to teach and to learn. Each member of this team will also provide teacher professional development as it relates to their specific realm. One Educational Technology Consultant per every secondary school to teach half time, and help teachers with technology the other half. Six Educational Technology Specialists to provide ed tech support to elementary teachers at a current ratio of roughly one Specialist per every five schools (with another six Specialists being deferred as future hires = final ratio of roughly 1:2). One Extended Technology Specialist (with one deferred) to assist teachers and students with technology in special learning environments (i.e. special education). Four Media Technology Specialists to work with on-site Media Assistants in maintaining the Media Centers (collection development, Big 6, etc.) 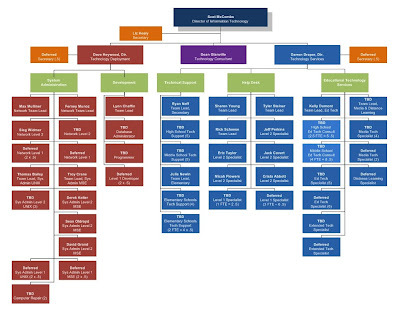 in our elementary schools at a ratio of roughly one Specialist per every 7 schools (with another two Specialist positions being deferred as future hires = final ratio of roughly 1:5). In the end, the coveted "Social Media Specialist" position has been merged with the "Distance Learning Specialist" position to form the Media Technology and Distance Learning Team Lead. After all, shouldn't every librarian/media coordinator/specialist be a "Social Media Specialist" in today's landscape? I certainly think so. Our students are using social media to learn without us. Why shouldn't we, as educators, be expected to understand what they're experiencing in order to best help them use such technologies effectively? This person will also work to coordinate many facets within of our district's Ed Net/Concurrent Enrollment programs. It is our sincere hope that the organization we've created will be able to provide the kind of technology support experience that the teachers and students in our schools clearly deserve. Furthermore, I greatly appreciate the confidence, trust, and support that has been given to our department by the Canyons School District administration and Board of Education. Questions, comments, suggestions? I'd love to hear what you have to say! * TBD = To be determined or hired before August 2009. * Deferred = Currently budgeted for but not to be hired in the immediate future. I was scolded today by one of the Media Specialists in my old district for having "too much technology" and "not enough library" in the description of the Media Technology Specialist positions that we opened today. Baby steps, one teacher at a time, and with lots and lots of love. Perhaps I've missed some of the multi-year conversation you've been having (do you even bother to link to each any more? ), but I can’t help wondering why you both seem to ignore k12 and the potential power they have in helping you both gain the leverage you’re clamoring for with regard to the adoption of open textbooks. Can you please help me understand why – as you see it – the key to this venture is that things must first take hold in higher ed? Surely there must exist some progressive district(s) out there willing (financially forced?) to take a gamble on what many of us see as a very possible future for textbook creation and distribution. Or is it really a gamble? Frankly, to me it appears to be one of the best options out there. For I see the creation of open textbooks – by the very teachers that will be using them – as a way for teachers to finally get the textbook they’ve been hoping for. Not the text that teachers must endure, but the one that they collaboratively fashion. Furthermore, with the kinds of budget cuts that have been forced upon k12 schools world-wide, their leaders would be foolish to not want to support an initiative that will dramatically decease costs in the long run. Aren’t teachers hired because of their abilities to create an effective learning environment (and aren’t districts tightening the belt)? Then why shouldn’t schools take a year off of textbook buying and put that money into the creation of open texts? With that money, districts could pay the best of their teachers to begin the process – not really with money, though, but with time. Time to create, time to share, time to collaborate. In time, I have every confidence that the quality of open textbooks will greatly surpass that of their commercial competitors – and as k12 students come to expect the flexibility that only open textbooks can provide, surely they’ll come to demand them in higher ed, as well. Or is student demand simply not enough to get some of the more stubborn professors to budge? Our continued emphasis on tools in pd misses that larger point, obviously, because the power of the Read/Write web is not the ability to publish; it’s the ability to connect. Broken record, I know, but tools are easy; connections are hard. And so the question becomes how to best help educators realize these potentials in the learning sense first. Because at the end of the day, community building has to become an integral part of what we do in our classrooms with our students, as well. We have to be able to model those connections for them and understand them in ways that are meaningful to our own learning practice. The challenge is, of course, that “continual, collaborative, on the job” learning isn’t very convenient for professional developers or for teachers in classrooms. It means re-thinking what learning looks like, and that’s a scary place still for most in education. In my recent on- and off-line discussions about the role of a Social Media Specialist in our schools, I've had in my mind the requirement that community building is an essential skill to be taught, modeled, and emphasized in our schools. That technology and social media are tools to achieve this end has merely been implied. Clearly, Will is correct in his articulation of the challenge that comes with community building. Potential for and processes of learning have changed and some of the good news is that many teachers, educational leaders, and even policy makers are beginning to understand this fact (at least I know that many in our still infantile district have a very good hold on what it means to learn in the 21st Century). Nonetheless, other challenges still exist - and getting it all done the way it should be done is simply not as simple as some might hope it to be. With this understanding in mind, I've spent a tremendous amount of time and energy in my attempts to create - with other key leaders in my district - the ideal technology support structure for teachers and students in our district. When we've finished, I'll share what we've created with you, with hopes that you'll pick apart what we've done and freely offer your suggestions for improvement. After all, aren't we all in this together? Quick update: Karl Fisch (still) rocks! He's taken the time to archive our social media specialist conversation here. Thanks Karl!